Silvia Federici and George Caffentzis describe the threat to capitalist legitimacy from the disaster in Japan and the use of nuclear power as a strategy of accumulation and terror. We are writing to express to you our solidarity at a time when the pain for those who have died or have disappeared is still raw, and the task of reshaping of life out of the immense wreckage caused by the earthquake, the tsunami and the nuclear reactor meltdowns must appear unimaginable. We also write to think together with you what this moment marked by the most horrific nuclear disaster yet in history signifies for our future, for the politics of anti-capitalist social movements, as well as the fundamentals of everyday reproduction. Concerning our future and the politics of anti-capitalist movements, one thing is sure. The present situation in Japan is potentially more damaging to people’s confidence in capitalism than any disaster in the “under-developed” world and certainly far more damaging than the previous exemplar of nuclear catastrophe, Chernobyl. For none of the exonerating excuses or explanations commonly flagged in front of man-made disasters can apply in this case. Famines in Africa can be blamed, however wrongly, on the lack of capital and technological “know how,” i.e., they can be blamed on the lack of development, while the Chernobyl accident can be attributed to the technocratic megalomania bred in centrally-planned socialist societies. But neither underdevelopment nor socialism can be used to explain a disaster in 21st century Japan that has the world’s third largest capitalist economy and the most technologically sophisticated infrastructure on the planet. The consequences of the earthquake, the tsunami and, most fatefully, the damaged nuclear reactors can hardly be blamed on the lack of capitalist development. On the contrary, they are the clearest evidence that high tech capitalism does not protect us against catastrophes, and it only intensifies their threat to human life while blocking any escape route. This is why the events in Japan are potentially so threatening and so de-legitimizing for the international capitalist power-structure. For the chain of meltdowns feared or actually occurring stands as a concrete embodiment of what capitalism has in store for us —an embodiment of the dangers to which we are being exposed with total disregard of our well-being, and what we can expect in our future, as from China to the US and beyond, country after country is planning to multiply its nuclear plants. This is also why so much is done, at least in the US, to minimize the severity of the situation evolving in and around the Fukushima Daiichi plants and to place the dramatic developments daily unfolding in and out of the plants out of sight. Company men and politicians are aware that the disaster at Fukushima is tremendous blow to the legitimacy of nuclear power and in a way the legitimacy of capitalist production. A tremendous ideological campaign is under way to make sure that it does not become the occasion for a global revolt against nuclear power and more important for a process of revolutionary change. The fact that the nuclear disaster in Japan is taking place in concomitance with the spreading of insurrectional movements throughout the oil regions of North Africa and the Middle East undoubtedly adds to the determination to establish against all evidence that everything is under control. But we know that nothing is further from the truth, and that what we are witnessing is the deepening crisis, indeed the proof of the “unsustainability” of the energy sector — since the ‘70s the leading capitalist sector— in its two main articulations: nuclear and oil. We think it helps, then, in considering this crisis, to think the Fukushima disaster together with different scenarios that, in their representation on the US evening news seem to have nothing in common with it and with each other. *Libya: where NATO and the UN are collaborating with Ghedaffi in the destruction of a rebellious youth whose demands for better living conditions and more freedom may jeopardize the regular flow of oil. *Ivory Coast: where French, UN and Africom (the US military command devoted to Africa) troops have joined ranks to install a World Bank official, handpicked by the EU, to clearly gain control of West Africa’s most important country after Nigeria and create a solid Africom-powered bridge connecting the Nigerian, to the Algerian and Chadian oilfields. *Baharain: where Saudi Arabian troops are brought in to slaughter pro-democracy demonstrators. Viewed, in this context, the threat the disaster at Fukushima poses to international capital is not that thousands of people may develop cancer, leukemia, loose their homes, loose their sources of livelihood, see their lands and waters contaminated for thousands of years. The danger is that ‘caving in’ in front of popular mobilizations, governments will institute new regulations, scrap plans for more nuclear plants construction and, in the aftermath, nuclear stocks will fall and one of the main sources of capital accumulation will be severely compromised for decades to come. These concerns explain not only the chorus of shameless declarations we heard in recent weeks (bouncing from Paris and Rome to Washington) to the effect that the path to nuclear power is one with no return, but also the lack of any international logistic support for the populations living in the proximity of the melting reactors. Where are the planes carrying food, medicines, blankets? Where are the doctors, the nurses, and engineers? Where is the United Nations that is so readily fighting in Ivory Coast? We do not need to ask. Clearly, as far as the EU/US are concerned, the guideline is that everything must be done to prevent this nuclear disaster from sinking into the consciousness of people and trigger a worldwide revulsion against nuclear power and against those who knowingly have exposed so many to its dangers. There is also something else however in the response of the world politicians to this juncture. What we are witnessing, most dramatically, in the response to the tsunami and nuclear disaster in Japan, especially in the US, is the beginning of an era in which capitalism is dropping any humanitarian pretense and refusing any commitment to the protection of human life. Not only, just one month after its inception, the catastrophe that is still unfolding in Japan is already being pushed to a corner of the evening news in the same way as nothing is any longer said about the oil spill in the Gulf of Mexico. We are also repeatedly informed that catastrophes are inevitable, that no energy path is safe, that disasters are something to be learnt from, not a cause for retreat, and, to top it off, that not all is negative, after all, Tokyo’s troubles are Osaka’s gain! This is the same doctrine that today we are dished out in debates on the financial crisis. Financial experts now all agree that it is impossible to prevent major economic crises, because, however clever government regulations may be, bankers can elude them. As Paul Romer, a finance professor in Stamford University, put in a New York Times interview (3/11/2011): “Every decade or so, any finite system of financial regulation will lead to systemic financial crisis.” That is, those of us who are on pensions or have a few savings or have taken out a mortgage must prepare for periodic losses and there is nothing that can be done about it! We think is our task to prove Mr. Chipman wrong –to prove that we will not be like the mindless laborious ants who mechanically reconstruct their hill not matter how many times it is destroyed. We believe it will be a major political disaster if in the months to come we will see business as usual prevail, and the surge of a broad global movement protesting what has been done to the people of Japan and to us all as the current will bring to our shore the radioactivity leaking from the unraveling plants. We are concerned however that a mobilization in response to the disaster in Japan should not be limited to demanding that no more nuclear plants be constructed and those in existence be dismantled, nor that more investment be directed to the development of ‘clean energy’ technology. 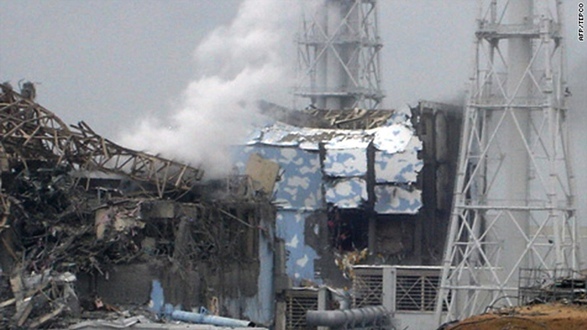 Undoubtedly, the Fukushima meltdowns must be the spark for a worldwide anti-nuclear movement. But we think, judging also from our experience in the aftermath of the disaster at Three Mile Island, that this movement will not have any hope of success if the struggle to eliminate nuclear plants or against the existence of nuclear armaments, is approached in the narrow manner characteristic of the anti-nuclear movement of the 1980s, if approached, that is, as a special issue, according to the argument that if we do not eliminate first nuclear power we will not be around to deal with other issues. This, we believe, is a short-sighted argument, as death, genocide and the ecological destruction of the environment come in many forms. Indeed, rather than as exceptions we should see the proposed proliferation of nuclear plants and the callous indifference demonstrated by world politicians to the possible destruction of million of lives under a nuclear regime as symptomatic of a whole relation to capital and the state that is the real threat to people across the planet. What we need is to approach the question of nuclear power as the prism through which to read our present relation to capital and bring our different struggles and forms of resistance together. Short of that, our political activities will remain powerless, separated and fragmented like the reports about Libya, Ivory Coast and Japan on the networks’ evening news. A first step in this direction is to establish that Nuclear Power has nothing to do with energy needs, in the same way as nuclear arms proliferation had nothing to do with the alleged threat posed by communism. Nuclear power is not just an energy form, it a specific form of capital accumulation and social control enabling capital to centralize the extraction of surplus labor, police the movements of millions of people, and achieve regional or global hegemony through the threat of annihilation. One of its main objectives is pre/empting resistance, generating the kind of docility and passivity that we have witnessed in response to such capital-made disasters as Katrina, Haiti and today Japan, and that in the past enabled the French and US governments to explode hundreds of atomic bombs in open air and underground tests in the Pacific and use entire population from the Marshall Islands to Tahiti, as guinea pigs. Nuclear power, therefore, can only be destroyed when social movements come into existence that treat it politically, not only as a destructive form of energy but as a strategy of accumulation and terror– a means of devaluation of our lives– and place it on a continuum with the struggle against the use of the “financial crisis,“ or against the cuts to healthcare and education. To this program, those of us who live in the US must add the demand for reparations for the descendants of the people who have been the victims of US nuclear bombs and nuclear tests. For our struggle must revive the memory of the crimes that have been committed in the past through the use of nuclear power beginning with Hiroshima and Nagasaki. For with memory comes the demand for justice. "Let's organize relief activities for the affected area by workers' unity and solidarity! Stop all nuclear plants immediately!" An excellent article - and a slap in the face for all those "communists" who, immersed in abstractions and an ideology of "progress" that hasn't really got out of the 19th century, can repress their consciousness and anger with justifications for nuclear power, even if they might oppose its current corner-cutting on its safety, as if nuclear power can ever be something other than part of capital. These arguments need developing, but they're a minimum basis for any possible "good" that can come out of this disaster, an opposition to nuclear power and its world, an opposition that the reformists of anti-nuke ecological movements avoid.